Abi is now a member of the school council. 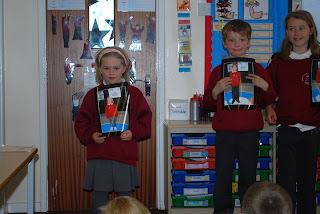 She had to do a little speech about how she would improve the school and then the class voted. Jacob spoke too and came second, not bad as, when we discussed it at home, he said he wasn't going to bother. I've put in a photo of her getting the badge at assembly. There's also a photo of the new Typhoon, the fast jet down here. 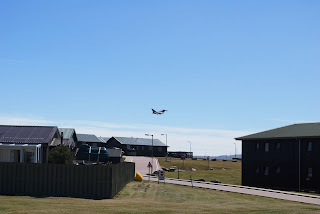 They changed the runway for the afternoon so they kept flying pretty low over the houses. It's very graceful to watch and goes vertical quite quickly after take off. We're on half term this coming week. Jacob and Abi only got 2 days but we've taken them out for the week as we are off to West Falkland to explore the parts we've not seen yet. I've handed in my notice at pre school as we now have a date for going, well a vague one! Should be leaving mid May for Allen to have the op on his knee. So only 3 months left, have just about done all I wanted to here so that'll be about right. No location in the UK for us yet, not even sure it will be the UK. Hope the wind dies down or I reckon the ferry will be cancelled until tomorrow, oh well!